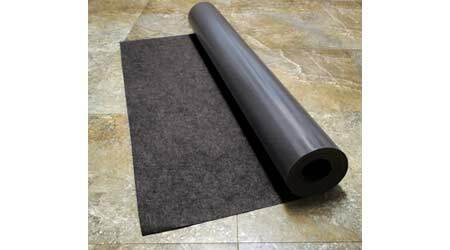 LuxWalk®, a high-performing underlayment engineered specifically to cushion floating or glue-down luxury vinyl tile (LVT) and to effectively soothe impact sound and floor-to-ceiling noise, delivers impressive numbers in impact insulation class (IIC) and sound transmission class (STC) tests. In a recent IIC test designed to measure in a laboratory environment, the impact sound transmission performance of LuxWalk installed under 5 millimeter (mm) floating luxury vinyl tile over 6 inches of concrete with no ceiling, the assembly achieved a sound rating of 52, appreciably higher than the rating of 50 that the International Building Code suggests. And in a recent STC test that evaluated the ability of LuxWalk installed under 5 mm floating luxury vinyl tile with no ceiling, the assembly achieved the same sound rating of 52. With thinner LVT, the numbers rate higher: in the IIC test 4.2 mm luxury vinyl planks installed over LuxWalk and 6-inch concrete with a suspended ceiling achieved a noteworthy sound rating of 72. And in the STC test, 4.2 mm luxury vinyl planks over LuxWalk and 6-inch concrete with suspended ceiling achieved a wow-worthy rating of 66. LuxWalk adds the right amount of cushioning under LVT, which can otherwise easily compress to the base when pressure is applied, and minimizes impressions and indentations that can occur in the finished floor. The product is available in 3- by 66.8-foot.